Historically, wilt and rust have been the diseases that posed a threat to flax production in Western Canada. Recently, the incidence of pasmo and powdery mildew has been widespread, particularly in Manitoba. They have caused localized disease epidemics. Maintaining the resistance to rust and wilt continue as objectives in developing new varieties. Breeding for resistance to pasmo and powdery mildew is also occurring. Rust is potentially the most dangerous disease affecting flax. It is a constant threat to flax production because it can survive locally and has the ability to produce new races that attack hitherto resistant varieties. The causal organism is Melampsora lini, a fungus that overwinters by means of teliospores on flax debris. 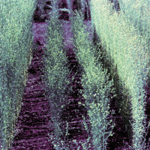 Early infections may completely defoliate flax plants and reduce the seed yield and fiber quality. Flax rust completes its life cycle on the flax plant, unlike many other rusts that require an alternate host. Symptoms: Rust is readily recognized by the presence of bright orange and powdery pustules, also called uredia. Rust pustules develop on leaves, stems and bolls but mostly on the underside of the leaves. The pustules produce numerous urediospores which are airborne and cause new cycles of infections during the season. Spread and infections are favoured by high humidity during cool nights, warmer day temperatures, and vigorous plant growth. As the season progresses, the orange pustules turn black and produce overwintering teliospores. The black pustules are most common on stems. Control: Complete control is achieved by the use of rust-resistant varieties. All registered varieties are immune to local races of rust. Planting susceptible varieties may not only result in serious yield loss, but also affords the fungus a chance to produce new races that attack resistant varieties. Additional safeguards include: destroying the plant debris, using certified and disease-free seed of a recommended variety, crop rotation, and planting the new flax crop in a field distant from that of the previous year. Flax wilt or Fusarium wilt is caused by the seedborne and soilborne fungus Fusarium oxysporum f.sp lini. The fungus invades plants through the roots, and continues growth inside the water-conducting tissue. This interferes with water uptake, and warm weather therefore aggravates the disease. Recommended varieties are resistant/moderately resistant. Symptoms: Seedlings may be killed shortly after emergence while delayed infections cause yellowing and wilting of leaves, followed by browning and death of the plant. Roots of dead plants turn ashy grey. The tops of wilted plants often turn downward, and form a “shepherd’s crook”. 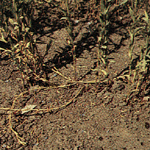 Affected plants occur more commonly in patches but may also be scattered throughout the field. The fungus persists in the soil, while the mycelia and spores survive for many years in debris of flax and other organic tissue. Wind-blown and run-off soil may spread the fungus from one field to another. Control: The most important control measure is the use of available resistant/moderately resistant varieties. Crop rotation of at least three years between flax crops maintains low levels of inoculum in the soil. 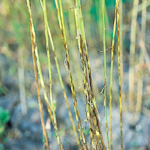 The causal organism of this disease is Septoria linicola, a fungus that attacks above-ground parts of flax and overwinters in the soil on infected flax stubble. Flax is most susceptible to pasmo in the ripening stage. Epidemics, however, can occur early in the season when favourable, moist conditions prevail. Pasmo can cause defoliation, premature ripening and can weaken the infected pedicels resulting in heavy boll-drop by rain and wind. Depending on the earliness and severity of the infection, pasmo reduces the yield as well as the quality of seed and fibre. Most commercial varieties lack resistance to this fungus. Symptoms: Pasmo is characterized by circular and brown lesions on the leaves and by brown to black infected bands that alternate with green and healthy bands on the stem. Infected flax tissue is characterized by tiny black pycnidia which are the fruiting bodies of the fungus. The debris carries numerous pycnidia which overwinter and produce masses of spores that cause the initial infections on leaves and stems. Spores are dispersed by rain and wind. High moisture and warm temperatures favour the disease. Lodging favours the development of pasmo, because of increased humidity within the crop canopy, and results in patches of dead plants completely covered with the fungus. Control: The best control is achieved by early seeding at the recommended rates to avoid high moisture conditions in the fall, using clean seed, treating seed with a fungicide, controlling weeds, and following a rotation of at least three years between flax crops. Stem break and browning are phases of a disease caused by the seedborne and soilborne fungus Aureobasidium pullulans var. lini, also called Polyspora lini. This disease is of minor importance in Western Canada, however, some damage may occur in the Parkland regions of Saskatchewan and Alberta in some years. Symptoms: Stem break is the first conspicuous disease symptom. 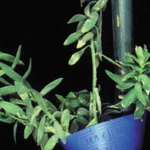 Development of a canker at the stem base weakens the plant, and the stem may break at this point when the plants are still young, or at a later stage. Plants may remain alive after stem breakage, but any seed produced may still be lost in harvesting. Initial infections in spring may start from spores produced on diseased stubble, and are spread by wind and rain. Infections may start during seedling emergence when seedcoats of diseased seed are lifted above the ground, and the fungus produces the first cycle of spores of the season. The browning phase is initiated by infections on the upper part of the stem that appear as oval or elongated brown spots, often surrounded by narrow, purplish margins. The spots may coalesce, and leaves and stem turn brown. Patches of heavily infected plants appear brown, giving the disease the name of browning. The fungus may penetrate the bolls as well as the seeds, or may produce spores on the seed surface. However, affected seeds may remain viable. Control: Use of clean seed produced by healthy plants is the most important control measure. Fungicidal seed treatment controls surface-borne inoculum, but is unlikely to be effective against inoculum borne inside the seed. Rotating crops and planting flax in a field distant from that of the previous year reduces spread of infection from diseased stubble. In spite of seed treatment, seedling blight and root rot can develop, leading to reductions in yield. Seedling blight and root rot may be due to soilborne fungi such as species of Fusarium, Pythium and Rhizoctonia. However, Rhizoctonia solani is the principal causal agent and can be particularly destructive in soils that are loose, warm and moist. R. solani survives as a composite of strains that differ in host range and pathogenicity. 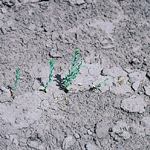 Strains attacking sugar beets and legumes such as alfalfa and field peas also attack flax. 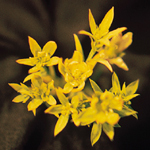 Yellow-seeded varieties (e.g. solin varieties) are more prone to cracking which renders them more susceptible to seedling blight and root rot than brown-seeded varieties. 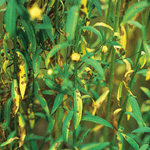 Symptoms: Blighted seedlings turn yellow, wilt and die. 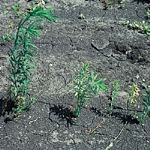 Infected seedlings may occur singly or in patches. Seedling blight may be inconspicuous, and gaps in the row may be the principal sign of disease occurrence. Roots of recently affected plants show red to brown lesions, and may later turn dark and shrivel. Diseased plants are often difficult to distinguish from those killed by the wilt fungus. Root rot symptoms appear in plants after the flowering stage. Plants may wilt on warm days, and turn brown prematurely; plants with root rot usually set little or no seed. Control: Seedling blight and root rot can be controlled by a combination of farm practices. Use certified seed of a recommended variety. Reduce cracking of seed by proper combine settings. Treat the seed with a fungicide. Practice a rotation of at least three years between flax crops, and plant in a field that is distant from fields sown to flax in the previous year. Avoid legumes and sugar beets in the rotation. Provide a firm seedbed, and use recommended fertilizer and seeding practices to promote vigorous stands. Sow flax on second-crop land after cereals rather than on summerfallow. The six-spotted leafhopper is the main vector which transmits the mycoplasma-like organism that causes aster yellows in flax, other crops such as canola and sunflower, and in some weeds. The disease occurs annually but commonly only traces occur in Western Canada. However, an epidemic in 1957 caused widespread severe yield losses in flax and other crops. Symptoms: Aster yellows symptoms include yellowing of the top part of the plant, conspicuous malformation of the flowers, and stunted growth. All flower parts including the petals are converted into small, yellowish green leaves. 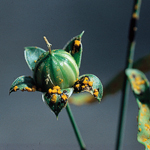 Diseased flowers are sterile and produce no seed. The severity of the disease depends on the stage at which plants become infected and the number of insect vectors that carry the organism. 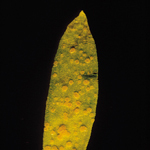 The mycoplasma-like organism overwinters in perennial broadleaved weeds and crops, but most infections are carried by leafhoppers that migrate from the United States. Control: Seed early to avoid the migrating leafhoppers in mid and late season. Seeding early also reduces the incidence and severity of aster yellows and its negative impact on yields. Crinkle is caused by a virus, called oat blue dwarf, that also causes disease in oats, wheat, and barley. 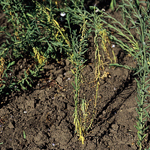 Only traces of the disease occur in flax in Western Canada. Symptoms: The symptoms are characterized by a conspicuous puckering of leaves, by stunted growth and reduced tillering. Flowering may appear normal but seed production is reduced. Like aster yellows, crinkle is a disease of flax that depends for infection on transmission by the six-spotted leafhopper. Control: Seed early to avoid the migrating leafhoppers in mid and late season. This disease was first reported in Western Canada in 1997. Powdery mildew has spread quickly and its incidence and severity have increased sharply in Manitoba and Saskatchewan. The causal agent is the fungus Oidium lini, and little is known about the overwintering and host range of this fungus in Western Canada. 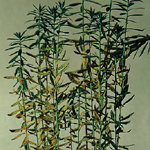 Early infections may cause severe defoliation of the flax plant and reduce the yield and quality of seed. Some flax varieties are resistant to this disease. Symptoms: The symptoms are characterized by a white powdery mass of mycelia that starts as small spots and rapidly spreads to cover the entire leaf surface. Heavily infected leaves dry up, wither and die. 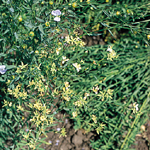 Early infections may defoliate the flax plant and reduce the yield and quality of seed. Control: The most economical control is through the use of resistant varieties. Early seeding will reduce the impact of this disease on yield losses by avoiding the early infections and buildup of epidemics. In certain localities, occasional fungal diseases may be due to Alternaria linicola causing seedling and stem blight, Colletotrichum lini causing anthracnose of leaves and seedling blight, Phoma exigua causing root rot, and Selenophoma linicola causing dieback. Alternaria and Colletotrichum are seedborne, and may be controlled by fungicidal treatment. Occasionally, Sclerotinia sclerotiorum causes stem mould, stem shredding and breakage in heavily lodged flax.